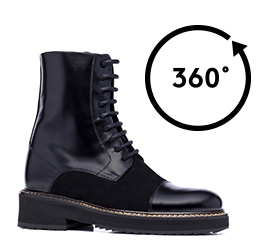 Up to 6 inches extra to your height thanks to latest "Cologne" handmade elevator boots by GuidoMaggi. The refined upper is in suede and shiny black calfskin. The comfortable inner lining is made of soft goatskin ,the insole and midsole are in genuine leather. The special rubber outsole, super lightweight and handcrafted features solid visible seams for added style and durability. The Guidomaggi height increasing system allows your feet to breathe, ensuring maximum comfort. The Cologne match both casual and formal outfits. GuidoMaggi craftsmen allow a range of possibilities for customization.